When Sir Reginald (or Reynold) Bray died on 5 August 1503, the present St George’s Chapel, commenced by Edward IV in 1475, remained unfinished. Although the Quire had been built and fitted out with magnificent carved woodwork, the walls of the Nave reached only window-sill height and much remained to be done to bring the building to the state of regal grandeur that had been planned. The importance of the legacy bequeathed by Bray in his will to the subsequent history of St George’s Chapel should not be underestimated. I will that my executors immediately after my decease endeavour themselves with all diligence, with my goods and the issues and profits of my lands and tenements by them to be received and had, to make and perform, and cause to be made and performed, the work of the new works of the body of the church of the College of Our Lady and St George within the Castle of Windsor; and the same work by them wholly to be performed and finished according and after the form and extent of the foundation thereof , as well in stone work, timber, lead, iron, glass and all other things necessary and requisite for the utter performance of the same. Without this legacy, the Chapel might not have been completed for many decades and thereby might have lost the unity of design which is a key element of its magnificence. Bray’s generosity enabled it to be “finished according and after the form and extent of the foundation thereof”. Regular visitors to St George’s Chapel will be aware of the many decorative features which commemorate Bray’s association with the College of St George – one hundred and seventy-five depictions of his badge or rebus (a hemp-bray) in stone, iron, wood and glass adorn the Chapel in his memory and a plaque records his interment in the chantry chapel that bears his name, although the exact location of his burial place remains unknown. However, few will be aware that the archives of the Dean and Canons of Windsor contain documentary evidence of Bray’s connection with the College during his lifetime, namely an acquittance which bears his signature. The acquittance [SGC XV.60.137], which dates from the reign of Henry VII, acknowledges the receipt by Bray “by the hands of Thomas Bolde” of ten marks from the Dean and Canons of Windsor for Bray’s fee for the half-year ended last Michaelmas. The document is signed “Reynold Bray”. It is dated the first of February but, sadly, the regnal year is partly obliterated because the right side of the document has been lost. However, it must date from between 1491, when Thomas Bolde or Bowde was appointed Canon of Windsor, and Bray’s death in August 1503. Ten marks was a considerable amount for half-a-year’s fee in 1500 (a mark being worth 13s 4d); the modern equivalent being about £3,240, according to The National Archives’ online currency converter. What was the fee paid for? Suggestions that Bray himself supervised building works at St George’s Chapel during in his lifetime have largely been dismissed. However, we know from Bray’s will that the chantry chapel had been “new made by me” for the burial of his body. Was the fee paid for supervising the works or performing some other function at St George’s? According to Professor Guth’s article on Bray in the Friends’ Report for 1971, Bray received a fee from Eton College as the College’s Chief Steward, presumably an honorific role. Might he have enjoyed a similar honorary position at St George’s? Alternatively the fee may have been paid to Bray in his capacity as a royal official, as payment for services rendered or favours sought. 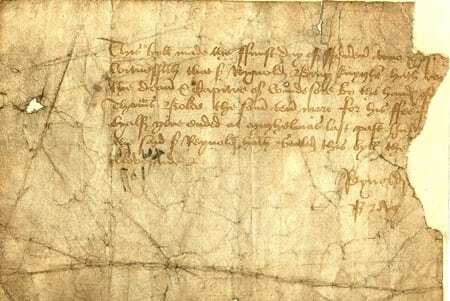 There are other acquittances in the archives for fees paid to those connected with Henry VII – Sir Thomas Lovell received 40 shillings for a whole year’s fee in 1498 [SGC XV.60.95], significantly less than Bray’s half-year fee; the annual fee of 1 mark (13s 4d) was paid regularly to Thomas Bayen “of the King’s Chancery” [SGC XV.60.33, 38, 47, 56, 61, 112]; whilst John Vavasour, Justice of the King’s Bench, received a fee of 20 shillings in 1489 [SGC XV.60.69]. Until further evidence emerges, the reason for the annual fee paid to Bray will remain a matter for speculation. However, it is gratifying that the Dean and Canons still retain in their archives the signature of their famous benefactor.